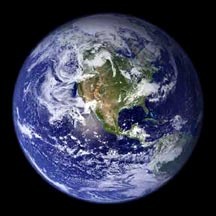 Photograph of Earth by NASA. January 2, 2004 Boulder, Colorado - In 1949, the U. S. Bureau of Standards produced the world's first atomic clock which counted the rates of vibration in cesium atoms. Then in 1972, the world adopted an international time keeping system based on atomic clocks. That's when it became necessary to synchronize the resonance of the cesium atom and earth time as measured by the earth's spin. After 1972, the Bureau of Standards had to insert what are called 'leap seconds' into the atomic time keeping system because the earth's rotation slowed a little bit each year.